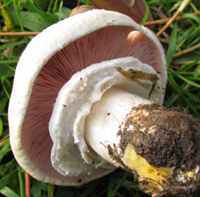 Agaricus xanthodermus, the Yellow Stainer, can cause serious stomach upsets and so should not be eaten. It can be confused with other members of the Agaricaceae. The Yellow Stainer occurs throughout Britain and Ireland and can also be found in other mainland European countries from northern Scandinavia right down to the Mediterranean region. This mushroom is also recorded in North America. 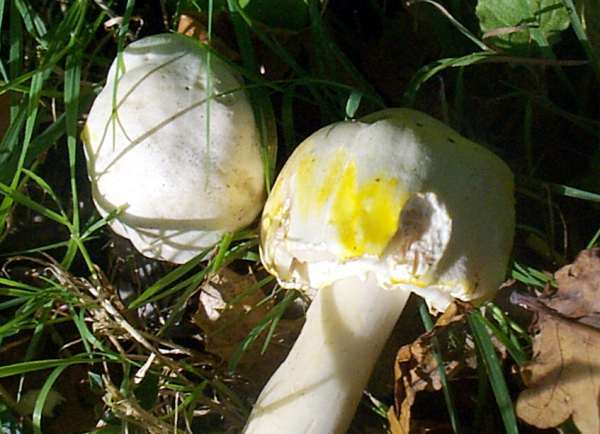 The Yellow Stainer also occurs in Australia, where it is an introduced species and is reported to be a very common cause of mushroom poisoning. No other common white mushroom turns such a bright chrome yellow so rapidly when handled, although a few of the edible Agaricus species do bruise slightly yellow, and so it is important to check all characteristics, including odour, when making an identification. The official description and naming of Agaricus xanthodermus, in 1876, was made by the French botanist Léon Gaston Genevier (1830–1880), who is mainly remembered for his pioneering work on the plant genus Rubus, which contains the various species and varieties of Blackberry, Raspberry, Mulberry, Dewberry etc and their plethora of hybrids. Synonyms of Agaricus xanthodermus include Psalliota flavescens Richon & Roze, Psalliota xanthoderma (Genev.) Richon & Roze, Agaricus xanthodermus var. lepiotoides Maire, Psalliota xanthoderma var. lepiotoides (Maire) Rea, Psalliota xanthoderma var. grisea A. Pearson, and Agaricus xanthodermus var. griseus (A. Pearson) Bon & Cappelli. The specific epithet xanthodermus comes from the Greek for 'yellow-skinned', and this species is the most infamous of a number of mildly toxic Agaricus species whose stem flesh turns yellow when cut. 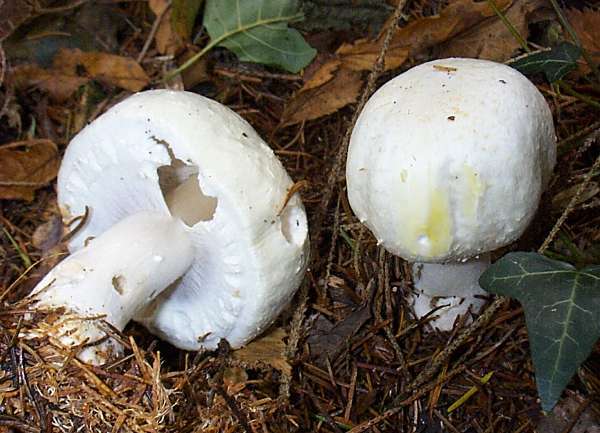 The Yellow Stainer, however, is particularly dangerous because it looks so much like an edible Agaricus such as the Field Mushroom, Agaricus campestris or the Horse Mushroom, Agaricus arvensis. As a result, it is one of the most commonly consumed poisonous mushrooms. The picture above shows just how obviously this toxic toadstool changes colour once the rim of the cap has been scratched. the colour change is most marked when the caps are young and fresh. No other common white Agaricus mushroom turns so rapidly chrome yellow when bruised on its cap rim or cut through near the stem base, and so knowledgeable fungus foragers ought never to be caught out by this poisonous toadstool. If eaten, the Yellow Stainer can cause stomach cramps, nausea, vomiting, sweating and diarrhoea. What is odd about this poisonous mushroom is that a small minority of people can eat it with obvious ill effects whatsoever. Initially globose but usually with a flat top, the cap of a Yellow Stainer expands to become broadly convex without an in-rolled margin. Initially pure white and matt, later greying, caps grow to between 5 and 15cm diameter at maturity, and they quickly turn chrome yellow when scratched or bruised. Gradually the bruised cap area becomes brown. In this picture the partial veil of this young Agaricus xanthodermus fruitbody is just beginning to rupture, revealing free, off-white gills that soon turn pink and later become grey-brown as the fruitbody reaches maturity. The stem diameter is 1 to 2cm with a smooth, silky surface and a bulbous base. A large white pendulous stem ring persists through to maturity. When cut the stem flesh quickly turns from white to chrome yellow, most markedly at the stem base. 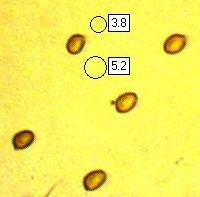 Ellipsoidal or ovoid, smooth, 4.5-6.5 x 3.5-5.5µm. Its taste is not distinctive, but do remember that Agaricus xanthodermus is poisonous. The Yellow Stainer gives off a noticeable odour of ink, phenol or iodine, especially when the flesh is bruised or cut. The odour is particularly strong when the base of the stem is cut. Upon cooking, the phenolic odour is intensified, begging the question how anyone can bring themselves to eat such a vile-smelling meal! Yellow Stainer Mushrooms are saprobic. These poisonous mushrooms are most commonly seen under hedgerows and at the edges of parks, gardens and other areas of disturbed soil, often in small groups but occasionally singly. Agaricus arvensis is superficially very similar to Agaricus xanthodermus but it bruises more slowly and only slightly yellow; its flesh smells of aniseed rather than of iodine or phenol. Agaricus campestris is similar in appearance but does not turn yellow when cut or bruised.